The most famous because of its close association with the Gurkha Soldiers.. 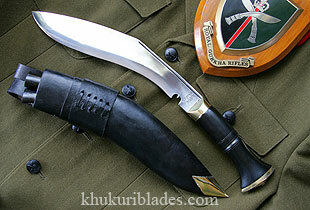 Among all khukuri/kukris, the Service no.1 is the most famous because of its close association with the Gurkha soldiers. It is issued to all British Gurkha soldiers on enlistment and they retain it throughout their army career. This knife is used during regular parades and also worn on duty. The blade is inscribed with recruitment date of each soldier. Senior officers regularly inspect it. This is the simplest of all khukuris. The scabbard has a twin stripes and brass bottoms at the back for the belt to go through.